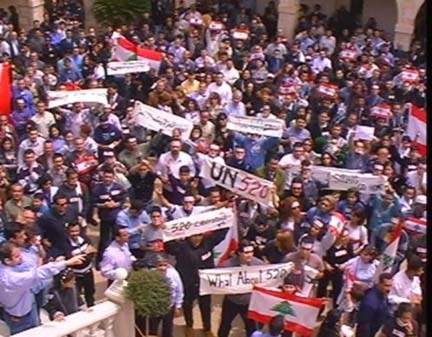 Lebanese youth, university students, engineers, physicians, lawyers, teachers and citizens from all parts of Lebanese society are leading a peaceful revolution to implement UN Security Council Resolutions 520 and 1559 that call for a Syrian pullout from Lebanon. 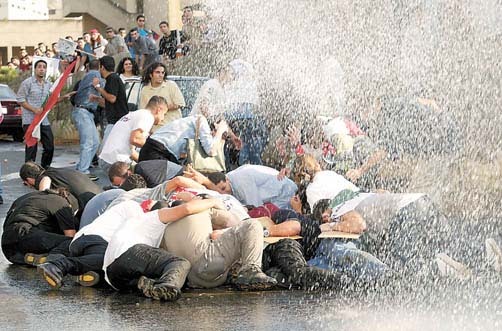 The media around the world called the peaceful movement "The Cedar Revolution” after the mass demonstration defied the military ban and managed to force the pro-Syrian government to resign on February 28, 2005, and the Syrian army to withdraw late April 2005. 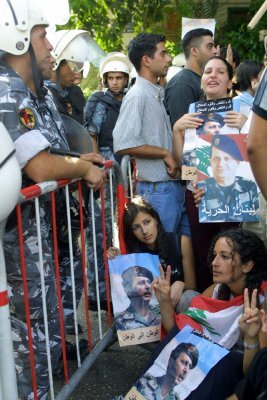 Demonstrations supporting UN resolution 1559 to end Syrian occupation of Lebanon . 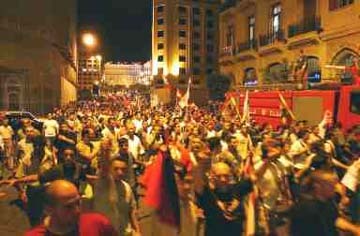 The wide Christian-Muslim united opposition front announced on February 18, 2005 the start of “The Peaceful Uprising for Independence” against Syrian occupation. 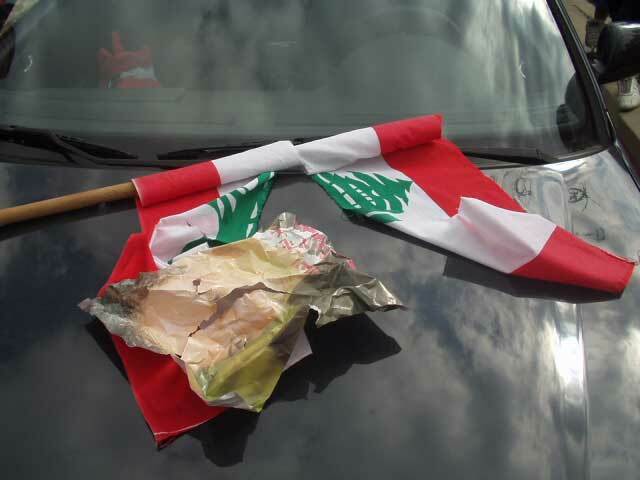 This call came after the assassination of Ex-Premier Rafik Harriri who had been in confrontation with the Syrian regime when it imposed a three-year extension term of the pro-Syrian Lebanese President "Emile Lahoud". 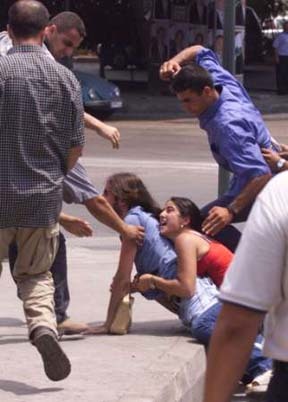 Hariri was assassinated on Feb. 14, 2005 after he joined the Anti-Syrian opposition. 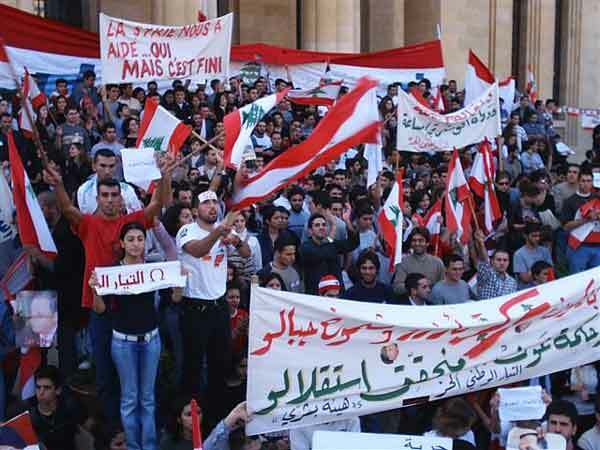 Lebanese college students and professionals lead most of the peaceful resistance demonstration against Syrian occupation of Lebanon. 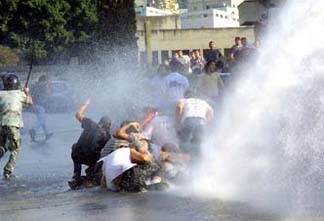 Lebanese youth demonstrating against Syrian occupation in a face-off with security forces. Hundreds are normally prevented from reaching sites of demonstrations. 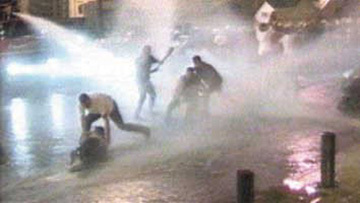 Those who make it are usually brutalized, arrested, detained and tried before martial courts. 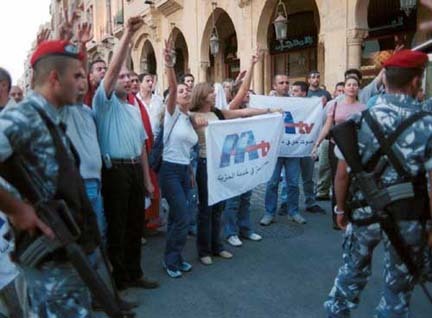 Protesters against shutting down Lebanese Murr TV (MTV) in 2002. 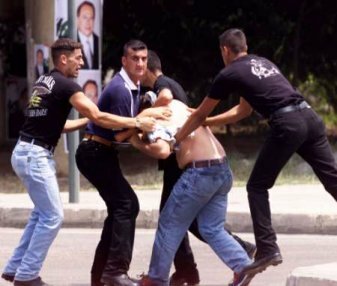 Civilian agents backed by Syrian troops and their proxy regime in Lebanon attack Lebanese students who were demonstrating in what became known as the "Events of August 7 th". 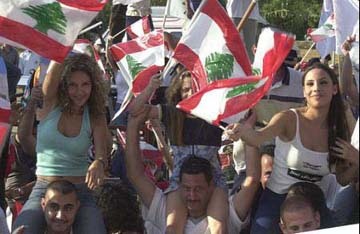 In August 7 and 8, 2001, the Lebanese Mronite-Catholic Patriarch Nasrallah Boutros Sfeir sponsored a historic reconciliation between Druze and Christian former militias –former bitter enemies during the Lebanese civil war. 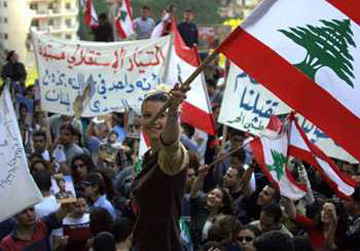 The Syrian regime and its proxy government in Lebanon were unhappy with the reconciliation that was seen as a potential threat to the influence of Syrian troops in Lebanon . 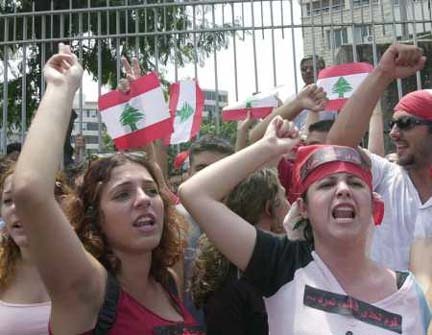 Security forces in occupied Lebanon arrested hundreds of Lebanese opposition activists in their homes and businesses, males and females aging between 16 and 77. Most were sent to martial courts with political charges; some spent years in jail. Ironically, portraits of the Syrian-appointed president in occupied Lebanon ‘Emile Lahoud’ appear in the background. 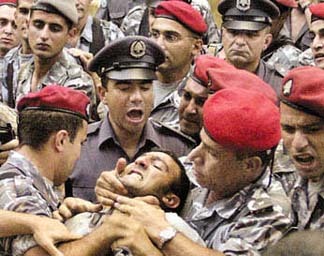 Security forces aggressing a civilian who was protesting the shutting down of Lebanese Murr TV in 2002. 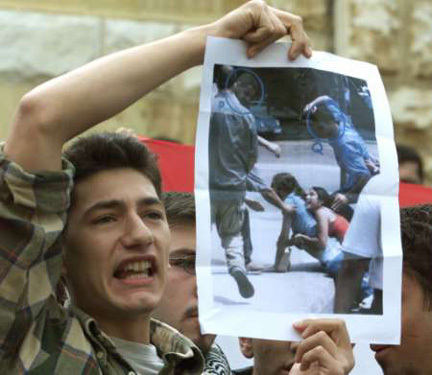 Lebanon youth lead most of the peaceful resistance demonstrations against Syrian occupation of Lebanon. 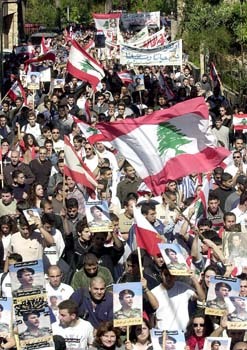 Lebanese youth demonstrating in support of the United Nations Security Council Resolution 520 that calls for Syrian withdrawal of Lebanon. 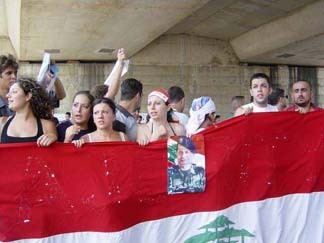 The demonstrators risked detention by smuggling banners in favor of UNSCR 520. 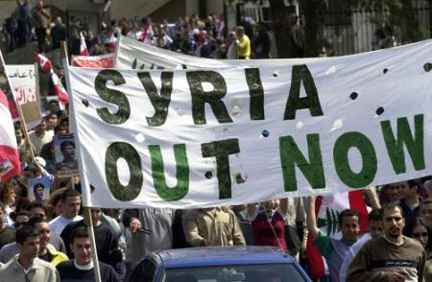 The Syrian-imposed government in Lebanon removed UN Resolution 520 articles and links from all its official websites. Until very recently, it was risky to mention Resolution 520 in public. 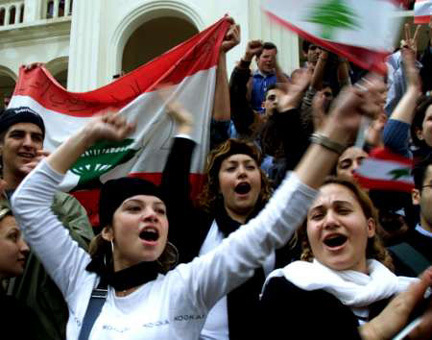 However, after issuing UNSCR 1559 in 2004, more Lebanese groups were encouraged to publicly announce their support to resolutions 520 and 1559. 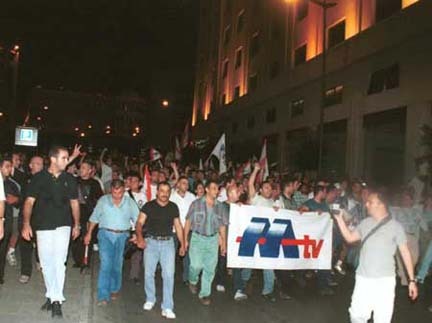 Families protest against shutting down Lebanese Murr TV in 2002. 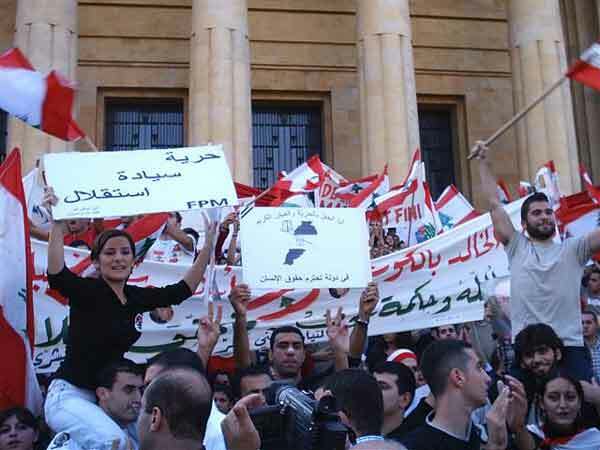 After the death of an MP in the Syrian-controlled Lebanese parliament, an election took place to fill the seat. The Syrian regime planned to appoint an MP in a rigged election process. However, the opposition groups planned for Gabriel Murr to run against the Pro-Syrian candidate since the elections were taking place in one district only which makes it harder to manipulate the results. The pro-Syrian regime was confident of its victory because of the deceiving techniques it uses such as forcing citizens to vote without the use of the secret ballot and allowing newly naturalized Syrians to vote. Despite all the illegal methods used, the Anti-Syrian candidate won with about 45% of the vote while the pro-Syrian candidate got 43%. 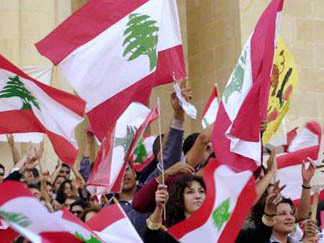 The Pro-Syrian authorities in Lebanon annulled the results, and appointed a third candidate who got only 2% of the votes for the empty seat. 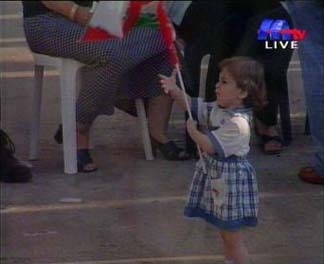 A child holding a Lebanese flag during the celebration of the victory of the opposition candidate over the pro-Syrian candidate. 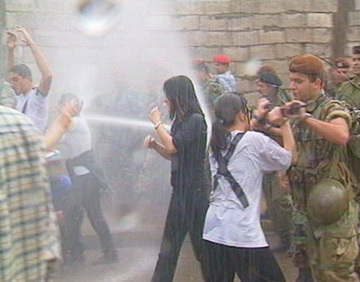 The picture is taken from the MTV broadcast.